Francisco Zuniga (1912-1998) ink drawing on paper, 14 x 11″ untitled, dated 1946, elegantly framed. This drawing can be found in the Zuniga Catalogue Raisonne vol. III. It dates to Zuniga’s time spent in Guatemala in the 1940’s. Note the pre-Columbian earrings. This is a wonderful, sensitive drawing, drawn by a young artist, sensitive to form and not yet intent on caricaturing his past efforts. p.o.r. Mexican sculptor, printmaker, draughtsman and teacher of Costa Rican birth, Francisco Zuniga studied sculpture under his father, Manuel María Zúñiga, in San José, Costa Rica, and after his arrival in Mexico City in 1936 at the Escuela de Talla Directa under the direction of Guillermo Ruíz (1895–1964) and Oliverio Martínez. Martínez, together with the painter Manuel Rodríguez Lozano, helped motivate his concept of form. Other lasting influences came from his encounter with Aztec sculpture and from the work of other sculptors, such as Auguste Rodin, Aristide Maillol and even Henry Moore, whose work, like his, was based primarily on the human body. 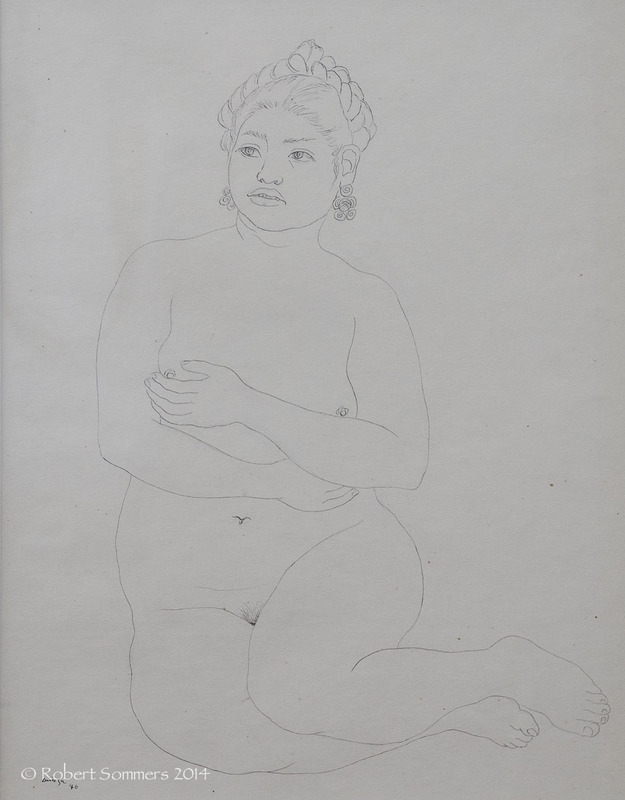 Throughout his career Zúñiga was especially devoted to the female form, naked or clothed. The monumental character of Zúñiga’s sculpture is evident not only in public commissioned works, such as the stone reliefs of the Allegory of the Earth and Communications (1953–4) at the Secretaría de Comunicaciones in Mexico City, but also in sculptures conceived for more private and intimate settings, for example Seated Woman from Juchitán (bronze, 1974; Washington, DC, Hirshhorn). In 1959, in works such as Standing Women (bronze; Mexico City, Mus. A. Mod. ), he moved from the non-academic naturalism of his early style, which was still linked to the 19th century, to a more realistic idiom, taking as his models the indigenous women of southeastern Mexico, whom he represented standing or seated, singly, in pairs or in a group. They are women with large bodies, both heavily built and scrawny, all seemingly caught in a violent transition from youth to old age. They inhabit a dramatic silence in which there is no communication, and occasionally they appear with the ancestral dignity of their race, as in Woman from Yalalag (bronze, 1975; Monclova, Bib. Pape). Only in exceptional cases do men appear. He availed himself of a variety of methods and materials, modelling in clay and plaster and also working in Carrara marble, alabaster and other kinds of stone; his preferred medium was cast bronze. Drawing served Zúñiga as an essential basis for his sculpture and for his prolific production as a lithographer. His prints, some printed in black and others in colour, presented the same subject-matter as his sculptures, with an equivalent emphasis on the volumetric treatment of female figures. Zúñiga, who as a teacher trained many outstanding Mexican sculptors, became a naturalized Mexican citizen in 1986.